That's one of the neat things about ephemera. How a single photo or piece of paper can evoke a flood of recollections. 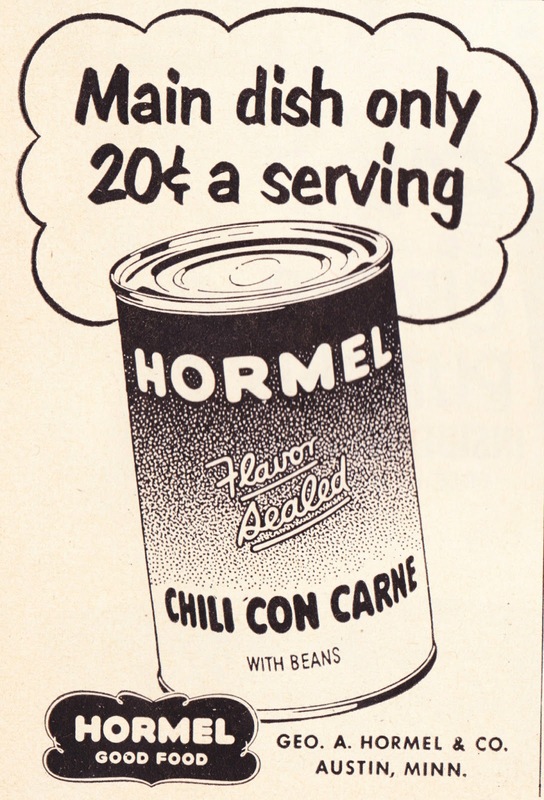 10 more marvelous meat treats from 1952 issue of Woman's Day: Anonymous writes: "I believe all this canned and processed stuff was still purchased and used a lot in the 1950s because of [the lingering effects of] World War II. 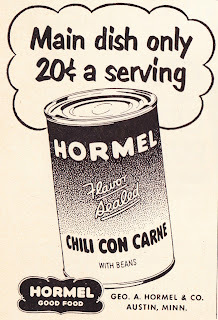 Fresh food was often not available so canned food was all we had ... and we had to make the best of it. So the advertisers did their best, I guess!" 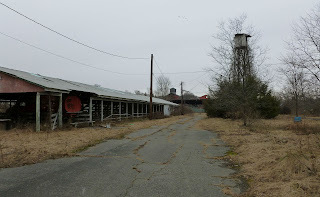 Photos of Taftville/Ponemah Mill in eastern Connecticut: Anonymous writes: "Thank you for posting these pictures! My grandmother grew up in Taftville. Her father was a boss in the mill and she was a secretary." So much time for researching and writing, but so little ephemera: PostMuse writes: "Oooo ... mystery photos and computer magazines! Someday some future Papergreat is going to find my collection of letters and postcards and have a field day sharing it in whatever form of media of the day. I hope it is holographic, at least. My mountains of written correspondence needs to be 3D." 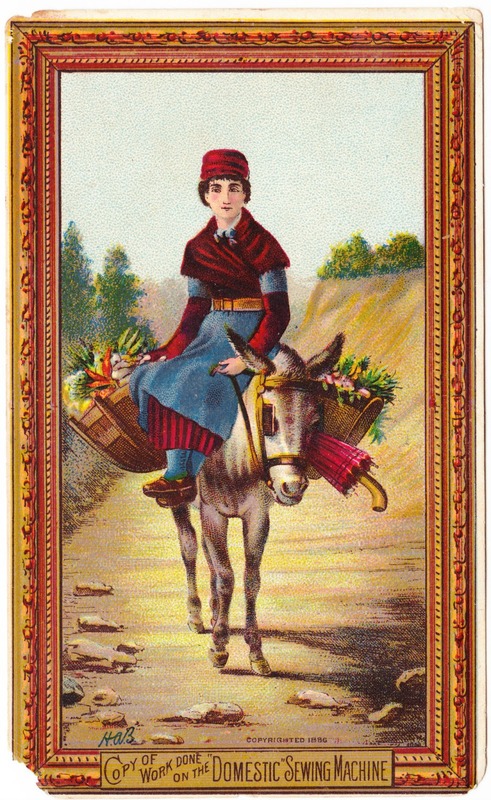 Of course, PostMuse's ephemera, including the archives of the Orphaned Postcard Project, will be well worth writing about 100 years or more from now. So I, too, hope this is all true! Inscription: Grandma doesn't approve of cutting cane as a career: Wendyvee of Wendyvee's RoadsideWonders.net writes: "Grandma knows what's best." Indeed. I sure hope Elsa listened to that advice! Regina Kline Tufarolo Altland: "Have several J. Altland's in family tree in this era in Paradise Township - also Jacob Altland's farmhouse in Farmers was used by Confederate Gen. Gordon during Civil War (would like to know exactly where it is - think it's still standing). Philip Altland (1737-1804) was progenitor of most Altlands in that area; hence Altland Meeting House, Altland Cemetery - so Altland House at least carries the name - not sure of any connection without more research. 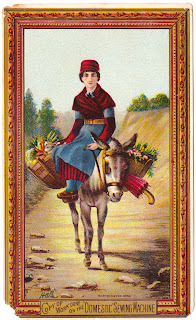 Neat card!" Blake Stough: "Christopher, I just realized that I obtained one of these today at the auction, but mine is stamped for the business of M.E. Hartzler, which was in the Odd Fellows Hall in York. Guess we both win!" "A few good things have happened since I posted that over a year ago. I joined the WP Historical Society and posted my family's history living there on their forum. In the meantime I looked up WP in the 1940 census which became available last year and specifically North St. where we lived. There I was able to locate names that were so familiar and some less so. I have heard from the son of one of the families who read my post in the forum. He must have been very young when we left for York as I do not remember him even though he remembers my family. He lives in Plains, PA, not far from WP and yesterday sent me a photo and asked if I knew who the people in it were. I sure did -- it was the little boy who I used to pull around in his little red wagon and his grandparents, sitting in front of the Christmas tree with the train underneath. In this photo Bobby is about 7 years older than when I pulled him in the wagon. (Google Dr. Robert A. Barnhart to see what an interesting career he has had.) I asked Jack to send more photos and unfortunately, many of the family and other photos were destroyed during Hurricane Agnes' flooding in 1972. We'll stay in touch with each other, possibly meet over the summer." Cheema, a resident of Pakistan, author of My Cool Postcard Collection, and someone I became acquainted with through Postcrossing, writes: "Hi! You have a very fine blog and lovely posts. I saw it for the first time today and am an instant follower of your blog. Keep up the good work!" Randy Parker, the hard-working managing editor of the York Daily Record/Sunday News, writes: "I have a friend who volunteered there in high school. Mostly, he'd sit and visit with patients. He liked to tell about one gentleman who loved to play chess. My friend, a very good chess player himself, would sit down and the gentleman would ask, 'How many moves?' Whatever number my friend gave, that's exactly how many moves the gentleman would take to win the game." Schuyler L writes: "Hey thanks for the history, it's very fascinating! I took a few pictures of the hospital in its current state. 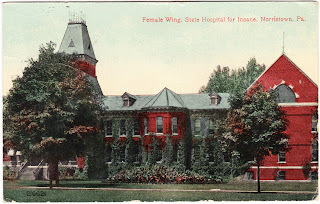 Check them out if you have a minute: schuylerL.tumblr.com"
I can confirm that there are some great photographs of Norristown State Hospital on Schuyler's website. Meanwhile, I don't believe that the facility is still fully in use, as I suggested in my original post. Clearly, some of the buildings are now abandoned. Here are some additional photos. Can anyone out there provide some more clarity regarding what is being used and what is closed on the hospital grounds? 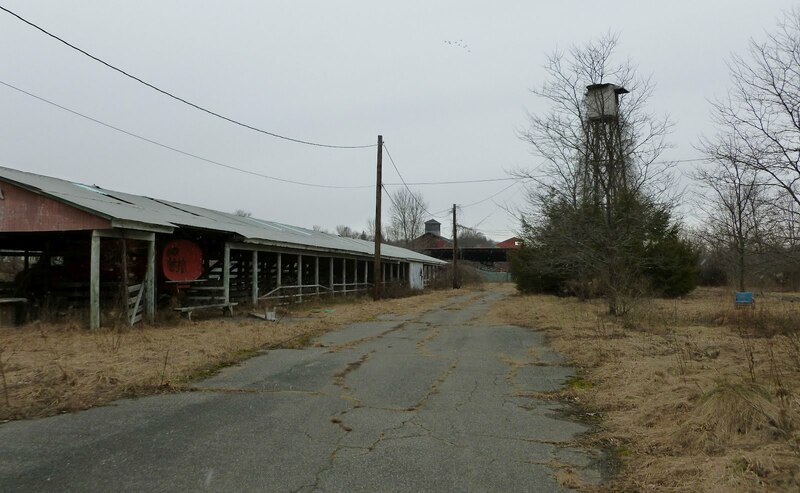 Photos of the abandoned Great Barrington Fairgrounds: L Najimy writes: "Greetings. I am working with the new owners of the Great Barrington Fairgrounds and would love to connect with you re: your photos. Please check out https://www.facebook.com/GreatBarringtonFairgrounds. ... Exciting things are happening!" Is Great Barrington's farm-to-table idea field of dreams? Eventually it will be warm and we can all do the Schuhplattler Dance: Wendyvee writes: "'Let's Schuhplattler like it's 1906' is my new mantra. Also, now I'm terribly worried that Miss Gladys really didn't know the whereabouts of the aforementioned skirt, bodice, and belt. I NEED answers. For, like, closure 'n stuff." My reply: 107 years later, and with this postcard as our only clue, I would say the odds of getting closure on this are grim. I guess we'd start by trying to track down the W.H. Johnson clan that resided in the Woodleigh section of Altrincham. Only a few buildings at Norristown State Hospital are still in use. At this point there are probably about 200 patients left, mostly in buildings 50 and 51, where criminals suspected of having some type of psychological disorder are taken. The hospital was designed by the famous Wilson Brothers and Company, who designed such prestigious buildings as the Baltimore and Potomac Railroad station in Washington D.C., where President Garfield was assassinated, as well as the main building for Drexel University.